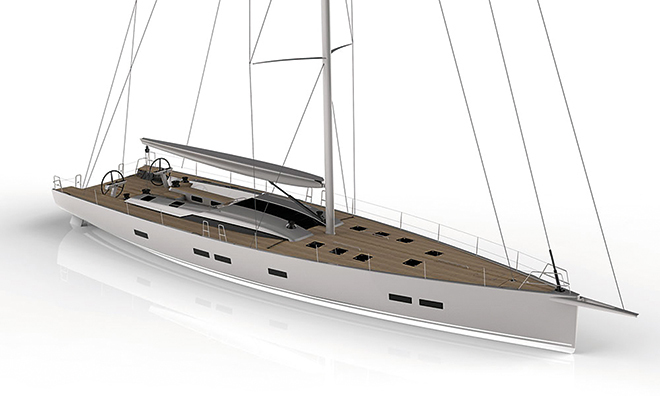 It has been announced by the Italian yard Mylius Yachts that in its flagship sailing yachts Mylius 76 series has been launched on 11th of and it has been named as E Vai. The yacht has been constructed from the superstructure and fiber hull of carbon-fiber and it has been designed by Alberto Simeone. If said, this 25.25 meter sloop is the yacht of a true blue water, and then it will not be wrong. It has achieved the highest CE Category A rating according to the Croatian Bareboat charter website. The yacht has a lightweight construction and she displaces just 30 tones. Moreover, it offers the comfortable accommodation for six guests that can be split between three staterooms. The yacht has a cabin of owner and two twin rooms, which is convertible and all of them are located in the bow area. The internal decoration of the yacht has also been done by the in-house team of Italian yard Mylius Yachts. The yacht has the waterline length of 21.5 meters; it means the boat can be operated entirely by the owner. However, it is not like the boat does not have crew space. A compact crew quarters are present at the aft, this allow the E Vai to accommodate the staff of three people when the owner needs them. Basically, the E Vai is a design that is flush-deck, which make this yacht more worthy for sports, thus it can be used for competing in Superyacht regattas of world class. The impression of this yacht is backed by the electric deck winches and single rudder set-up fitment from Harken. The yacht has many world class features that make it worthy in terms of money as well as its use. More details about the yacht can be collected from the website of the developer.